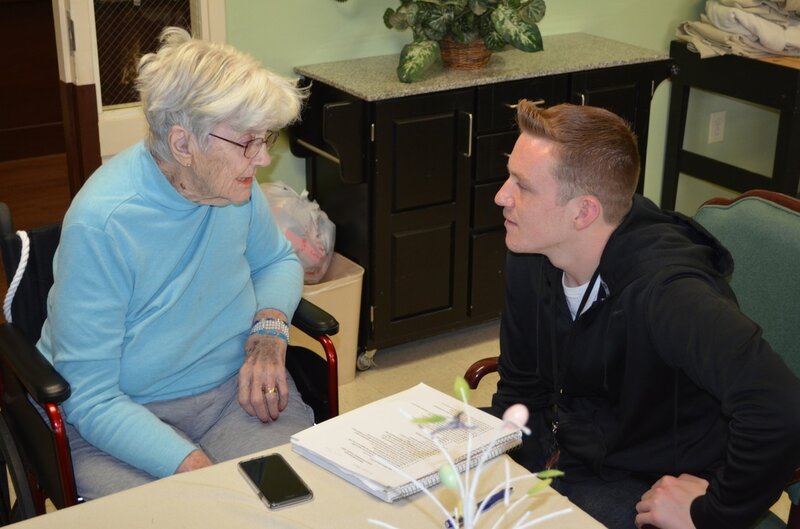 interview the now 96-year old Mrs. Ivins at the Anberry Rehabilitation Hospital one on one. What she told me I will never forget. Today we live in a world that can sometimes be cold and harsh. With topics about suicide, drunk driving, and death swirling around it’s hard to remember that there always is a light at the end of the tunnel. People like Ivins have pushed aside that darkness and know the true meaning of life. Ivins says, “The meaning of life is to try to make a difference and to treat everybody how they want to be treated.” Many people tend to forget this. Ivins goes on to say, “I just think it’s terrible if we’re discontent, because there’s always something that we can be thankful for and happy about. I don’t let myself mulligrub.” Being content is one big thing in life. We live in a society where people always want more. People always want the new phones, the new systems, and the new cars. According to Ivins, we ought to appreciate the little things in life. This would be the best way to live and will truly allow for a person to be content and happy in life. Although Francis Ivins would claim to be just an ordinary, uninteresting person, she was anything but. When she was in the ninth grade, she dropped out of high school so she could marry her husband, a marriage that ​​would last 60 years. She ended up having one daughter with her husband. Not only that but she puts a big emphasis on family and friends and when it comes to friends Ivins has one rule, “You have to be a friend to have a friend.” Growing up, she enjoyed playing sports such as basketball and volleyball and she still enjoys watching those sports to this day. Coming from a high school student’s perspective, I believe that Ivins is someone that could change another person’s life. Ivin’s had a lively and charismatic character and one that could rub off on another person. As a senior about to graduate high school, everything is so much more real and stressful. We have to make major decisions that could affect our lives forever. However, Ivins reminded me of something and that is to be thankful. A lot of the time people lose sight of what is really important and it has become a problem. People need to realize what they have right in front of them and then they could truly be happy. Another big thing that Ivins reminded me is that we also have to be forgiving. Another thing that today’s society tends to do is hold onto grudges. If you continue to go on in life and not forgive others, then you will never truly be able to be happy. Ivins says, “Unforgiveness in your heart will eat you up.” People need to be reminded that life is valuable and good and there definitely are the small things in life that we can enjoy. Life truly is valuable and people definitely need to realize this. If we can begin to think about life in a new perspective, then we can begin to enjoy it more. Take notes from someone like Francis Ivins, she can show you what it truly means to be alive.